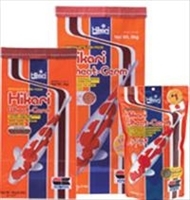 Wheatgerm in floating food stick form. Supports a healthy immune system, thanks to optimum nutrition. Medium size floating pellet. 500g bag. The daily diet for growth in cooler temperatures for all pond fish. 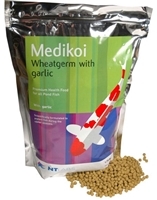 High quality balanced diet for Autumn & Spring feeding with superior digestibility. Typical Analysis: Protein 32%, Fat 4%, Fiber 4%, Moisture 10%, Ash 12%. With high levels of vitamin E.
Medium Jar - select pellet size. Analysis: Protein 20%, Oil 6%, Ash 2.5%, Fibre 2.5%. 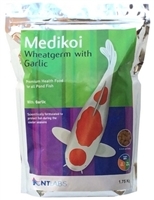 Vitamins A, D, E and C Our own medium pellet wheatgerm food for Spring and Autumn feeding. 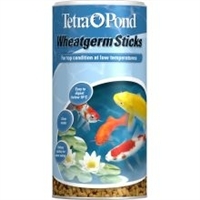 Use when the water temperature is between 6 and 12deg C.
Medium Jar - medium pellet size. Analysis: Protein 20%, Oil 6%, Ash 2.5%, Fibre 2.5%. Vitamins A, D, E and C Medium Pellet. Medium size floating pellet. 2kg bag. Medium size floating pellet. 5kg bag. Large Bucket - medium pellet size.